Reports & Info Page "1"
Dr. Mary: The research that "started it all"
Note: Coconut Oil needs to be Virgin Coconut Oil. Note: To stay effective, Coconut Oil NOT to be heated above 350º degrees. Is It Put Up OR Shut Up Time? 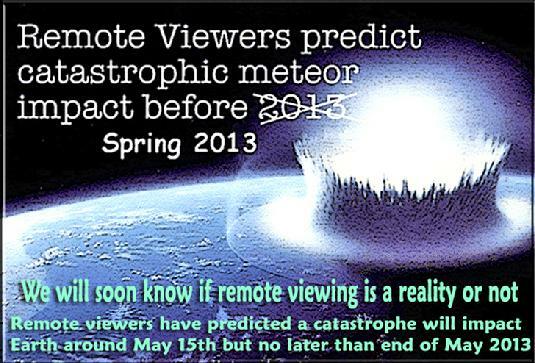 Remote viewers like Ed Dames and "Cosmo", (see farsight.org) as well as professionals and military trained RV teams have all agreed that the event is imminent and have put their reputations on the line. Some have reportedly already left for their "safe havens". - Lunar Lies & Pyramids On The Moon - "First we thought this was only stone, but this is something else" - "During my 20-year diving career, including 6000 dives, I have never seen anything like this. Normally stones don't burn"
Wonder Who Used To Live or "Hang Out" Down Here?!? Do You Suppose They Might Be Planning To Come Back? 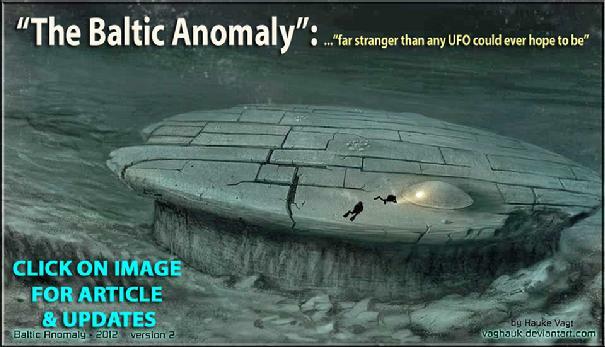 Object is 200ft accross mushroom shaped comprising a thick pillar rising 8 metres out of the seabed with a 4 metre thick dome on top (like a mushroom shape) – rising a total of 12 metres (approx 40 feet) high above the surrounding seabed. Cavities-like corridors inside the object. Straight and smooth walls in certain areas with many right angles. There are visible formations on top of the object, which are set at a 90 degree angle and look like passageways or walls, as well as something that looks like it could be a staircase. Stone circles, like “fireplaces”, of hard black “almost petrified” burnt looking stone each a few inches in diameter, like 4 or 5 pearls in a necklace in various arrangements on top of the dome. Spherical object nicknamed “The Meringue” (dome) is 4 metres wide and sits on top of the object. 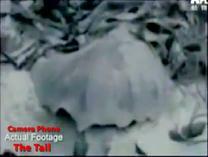 Twenty-five centimetre hole on top of the object, it’s not known yet where it leads or what if anything is inside. Long runway or “skid marks” leading to object point north. NOTE: The Estonia disaster occurred on Wednesday, 28 September 1994, between about 00:55 to 01:50 (UTC+2). The Swedish government suggested burying the whole ship in situ with a shell of concrete. As a preliminary step, thousands of tons of pebbles were dropped on the site. 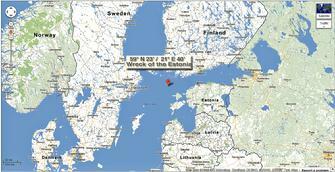 59° N 23′ / 21°E 42′ - about 22 nautical miles on bearing 157° from Utö island, Finland, in 74 to 85 metres (243 to 279 ft) of water. The Estonia Agreement 1995, a treaty between Sweden, Finland, Estonia, Latvia, Poland, Denmark, Russia and the United Kingdom, declared sanctity over the site, prohibiting its citizens from even approaching the wreck. The treaty is, however, only binding for citizens of the countries that are signatories. At least twice, the Swedish Navy has discovered illegal diving operations at the wreck. The wreck is monitored by radar by the Finnish Navy. Nor do Seals try fighting off Sharks with Handmade Stingray Harpoons!